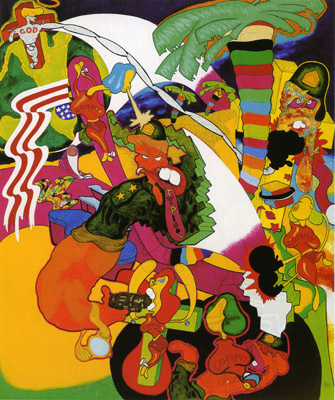 Peter Saul, Vietnam, 1966, oil on canvas, 79 1/4 x 67". Peter Saul has been enjoying (or mired in) a protracted state of critical rediscovery for nearly twenty years—a process that may finally reach its conclusion with the artist's first American survey, organized by guest curator Dan Cameron. We've long heard how Saul's acrid allegories of rubbery humanoids stood apart from Pop's prevailing pieties and paved the way for artists from Mike Kelley to Dana Schutz, but this show of roughly fifty paintings and drawings made since the late 1950s will put his own oeuvre squarely in the spotlight. At a time when global politics seem as cruel and surreal as those depicted in Saul's paintings, he'll likely survive the glare. Travels to the Pennsylvania Academy of Fine Arts, Philadelphia, Oct. 18, 2008–Jan. 4, 2009; Contemporary Arts Center, New Orleans, Feb. 14–May 24, 2009.